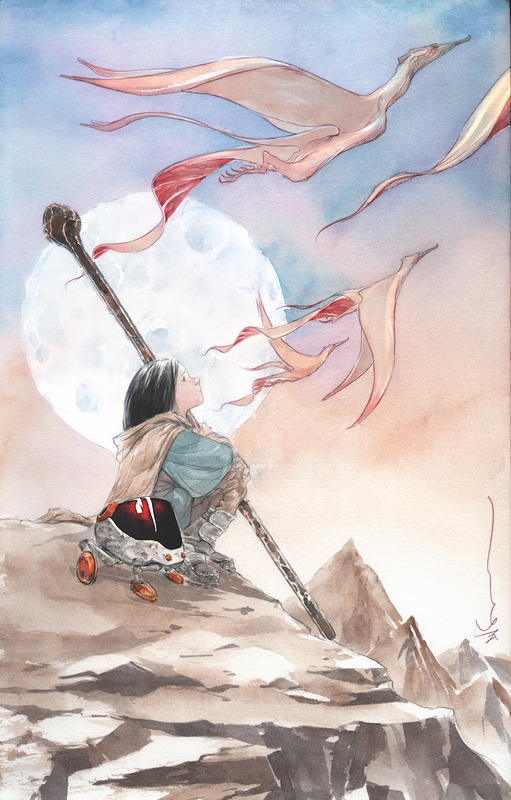 Jul 6 As "Descender" ends, Jeff Lemire and Dustin Nguyen will rise again with Image Comics' "Ascender"
All good things must come to an end... but that doesn't mean it's the last we hear of it. While Descender- the Image Comics series from superstar team Jeff Lemire and Dusting Nguyen- may soon be reaching its conclusion, it's been announced that Lemire and Nguyen will return to their world in 2019. With Ascender, the story jumps ahead ten years and sees a world where machines are no more, allowing magic to take its place. No doubt this series will be full of lots of great storytelling and absolutely lush watercolor artwork, just like you've come to expect. PORTLAND, OR, 07/06/2018 — From the powerhouse creative team behind the bestselling, award-winning DESCENDER—Jeff Lemire (GIDEON FALLS, ROYAL CITY) and Dustin Nguyen (Batman: Little Gotham)—launches an all new series set in the same universe, ASCENDER. The DESCENDER story’s not over and this new ongoing series is set to recapture fans’ hearts and imaginations in 2019. “Dustin and I love the world of Descender and we're re-energized by this new direction, which has opened all sorts of new storytelling possibilities for us,” said Lemire. “Ascender will feel like a continuation of the Descender saga and like a brand new book all in one." Stay tuned for more news in the next few weeks. Ascender will begin in 2019. Jul 6 BOOM! gets an attitude with new series "WWE: Attitude Era"